Vice-President Biden sent an email to supporters today in which he touted the Obama Administration’s efforts to pass gun control. Having read that, Democrat gun owners should rest assured that their precious hunting rifles are safe … right? After all, it is only those black, scary rifles that Democrats want to ban … isn’t it? 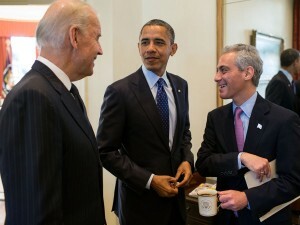 Well … while Vice-President Biden is doing his best to divide and conquer gun owners, former Obama Chief-of-Staff Rahm Emanuel is trying to have banks drop gun manufacturers as customers unless the gun manufacturers agree to support the Administration’s gun control policies. If successful, such a maneuver would be a death knell for those manufacturers who refuse to become puppets of the government. I have to ask those gun owners who continue to vote for Democrats … if the gun manufacturers go out of business, who will make your precious hunting rifles? This entry was posted in 'Assault Weapons', Chicago, Democrats, Gun Control, Gun Sales, President Obama. Bookmark the permalink. Emanuel is the mayor of Chicago, right? You’re making an awfully big leap, IMO. I know you think it’s justifiable. Perhaps your argument would be more powerful if you just attacked Emanuel for his 1st amendment use of persuasion around freedom of association issues, while leaving those unaffiliated with the governance of the City of Chicago out of it. The “Chicago way” will ultimately disappear once it gets into and through the courts. Joe Biden was in town today at VCU & protected with guns – what a snow job. They could always go to offshore banking .. that might have some further advantages, too.